Milton Court hosted the London performance (on 12 May 2016) of Ex Cathedra’s Shakespeare Project, a wide-ranging collaboration of words and music involving all parts of what is dubbed the 'Ex Cathedra family', local schools and the live audience. 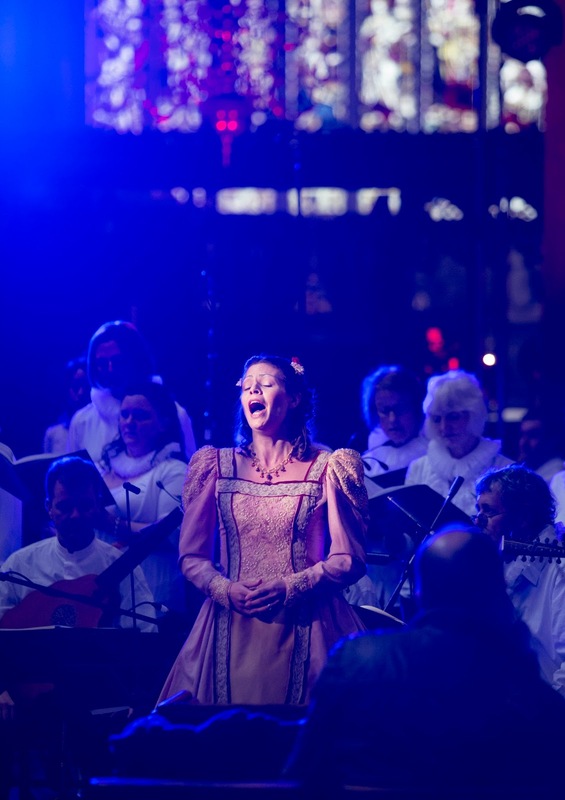 There have already been performances in Stratford Upon Avon, Birmingham Town Hall, Hereford Cathedra and St Peter’s Collegiate Church, Wolverhampton, and the final outing will be to Southwell Minster at the end of May. Ex Cathedra was conducted by Jeffrey Skidmore, with actor Samuel West as David Garrick. The programme consisted of two ‘occasion pieces’, one from 1769 and one from 2016, The Garrick Ode by Thomas Arne and David Garrick, and A Shakespeare Masque by Sally Beamish and Carole Ann Duffy. This gave us the opportunity to reflect on how our view of Shakespeare – and of what makes a national treasure – has evolved over four centuries. The Garrick Ode was written as a tribute to Shakespeare by one of his most important champions, actor-manager David Garrick, to mark the creation of a statue of Shakespeare in Stratford upon Avon. Garrick’s text was read on this occasion by Sam West. The music consisted of Airs and semi-choruses by Thomas Arne and reconstructed by Adrian Horsewood, with two missing choruses provided by Sally Beamish. Ex Cathedra members took the parts of named actors of the day, and the accompaniment was provided by a harpsichord, violin and bass viol. The accompaniment had a hypnotic feel – possibly a good thing as far as the text was concerned; David Garrick may have been a great actor and very important for the history of the theatre, but really, he was not much of a poet. Well, not to our twenty-first-century ears, anyway: think Oscars ceremony written in 1769 doggerel. The performers worked hard to make it resonate for us, but I doubt it will get many outings except as a companion piece for the Beamish. The second half had an immediate appeal. Sally Beamish was inspired by Britten’s Noye’s Fludde for her Shakespeare Masque, a commission involving professional and amateur singers and local schools and setting texts by Carol Ann Duffy. The primary-school children clearly had great fun performing the texts, singing and moving around the space – though sadly it was one of those occasions when there were more people on stage than in the audience (unless the families had attended a dress rehearsal locally? – or the London scene is dominated by the outreach work by Shakespeare’s Globe?). The Ex Cathedra Academy and grown-up choir sang choruses and soprano Katie Trethewey sang Anne Hathaway’s evocative and sensuous Air ‘Come live with me’. The City Musick accompanied on what was called a Broken Consort, led by William Lyons on recorder and flute, and comprising viols, cittern, bandora, lute and percussion. 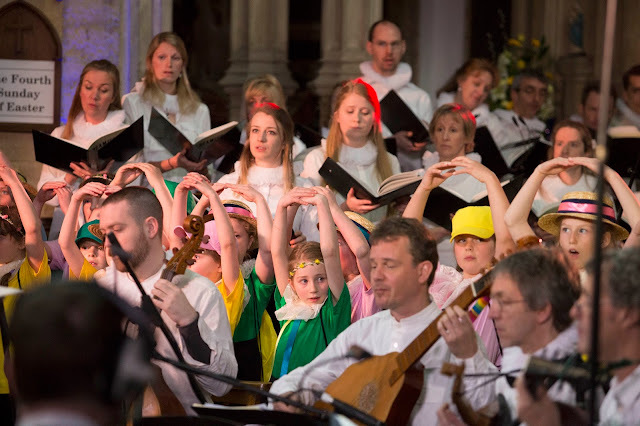 The Renaissance dance forms and harmonies created an irresistible energy and atmosphere and, with the audience participation in the final chorus, made for a joyous occasion all round.